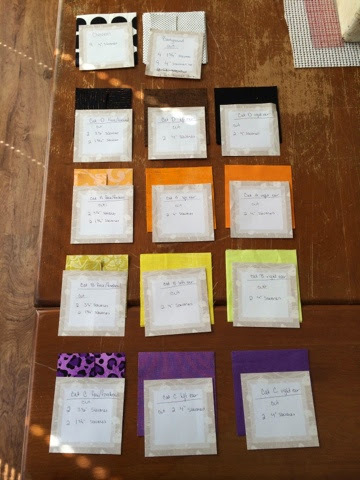 You might remember that I hosted a mini quilt swap? Yeah? 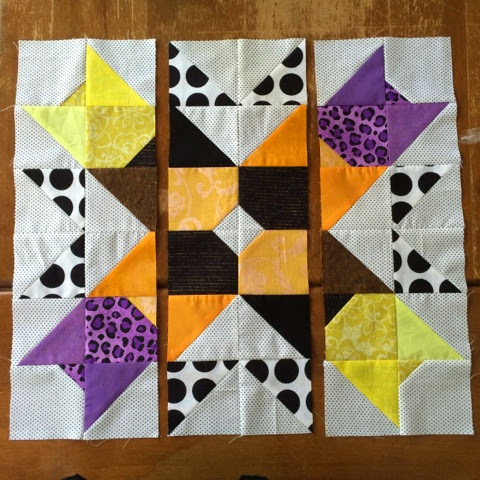 Well, this CatStar Block was from that swap. I saw it under the hashtag and had to compliment it's maker, Janda, on how cute it was. She made it up out of her own brilliant head! Isn't she clever? There were a lot of requests for a tutorial on it but since she doesn't have a blog, she had to say no. So, I offered to help out. 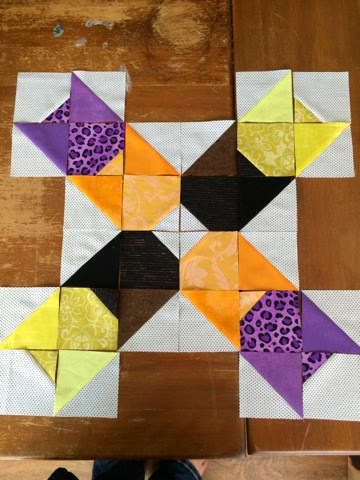 I've decided to host a little #halloweencatstar quilt-a-long. Are you interested? One lucky participant will receive a Halloween trick-or-treat bag, stuffed full of goodies,from me! You must complete your Halloween CatStar block in order to be entered in the drawing, though. Let's get going, shall we? 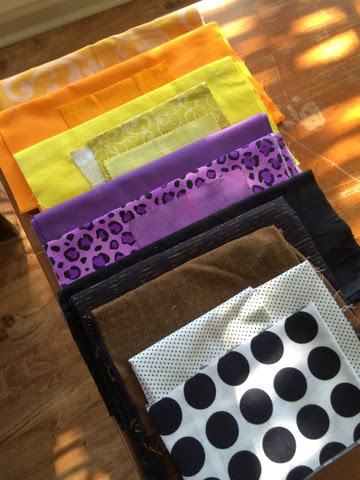 You will need four colors of fabrics, in three shades each, and two different background fabrics for a total of fourteen fabrics. 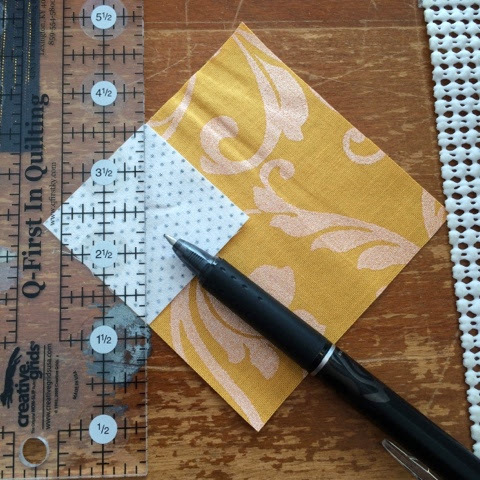 Fat quarters and charm squares work great. 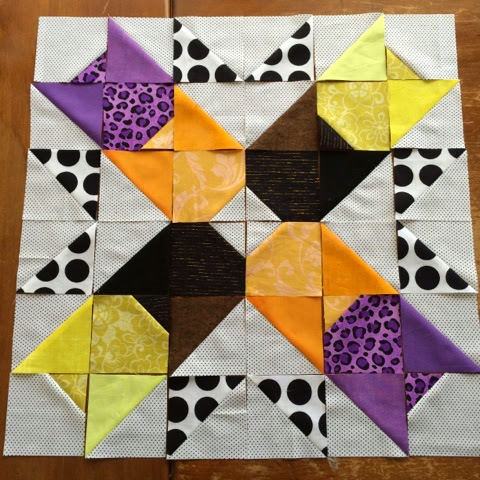 Begin by making the center of the CatStar Block. 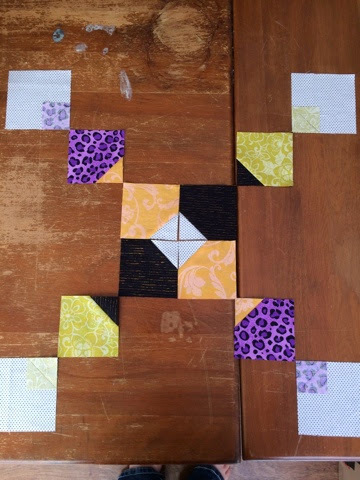 Get your 3 1/2" face/forehead squares for the center cats and the four 1 3/4" squares. 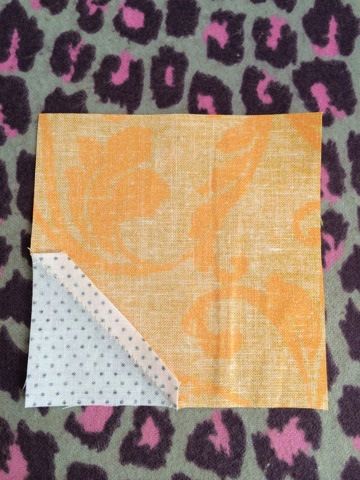 Place the small square in one corner of the large square, right sides together. 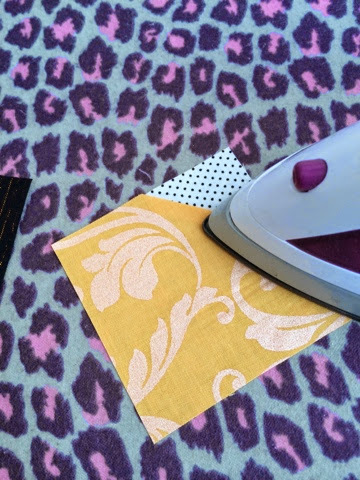 With a fabric marking both, draw a line from corner to corner. 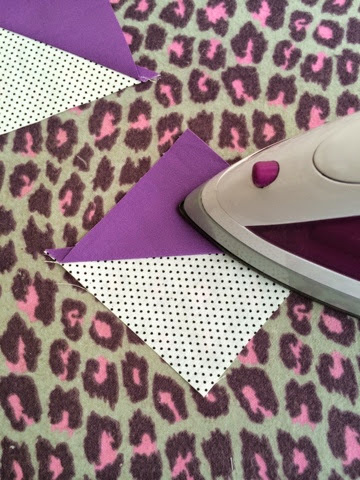 Flip the corner fabric back and press. Do this for all four inner star cat pieces. 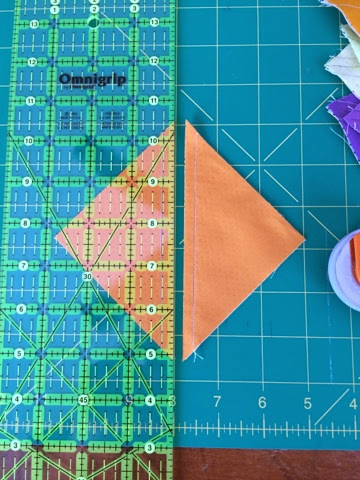 For the outer star cat pieces, you will repeat the above process using the remaining four 3 1/2" face/forehead pieces and the four 1 3/4" coordinating pieces. You will also need to repeat this process for the four 4" background corner pieces and the four 1 3/4" outer star cat for heads. 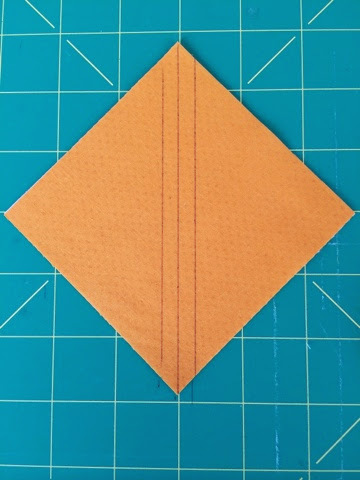 To make the ears, you'll need to make half square triangles. With right sides together, match up one ear with one background square. You'll be doing all the ears at this time, so go ahead and match them all. Draw a line from corner to corner, right down the middle of each ear, then 1/4" away on each side. The first line (the one that is now on the middle) will become your cutting line. The other two are stitching lines. 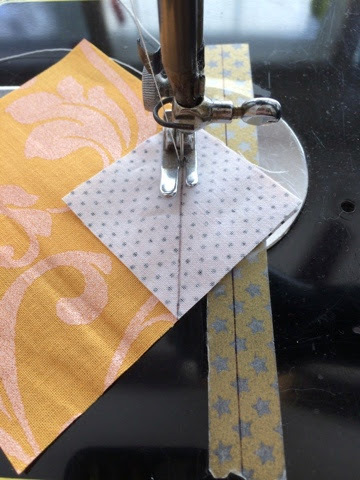 Stitch directly on the line, adding a new square pair (teehee) after the last of the line is sewn & without cutting your thread or picking up the presser foot. This is chain stitching. When you've reached the end of the ear chain, turn it around and stitch the lines on the other side. 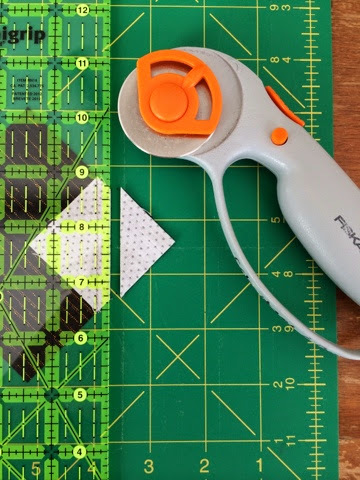 Snip the threads to separate, then use your rotary cutter and acrylic ruler to cut them in half. 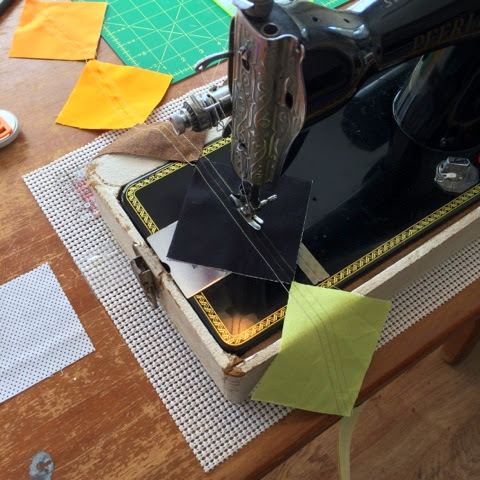 Carefully press the half square triangles open, making sure the seam is towards the darker side. Now it's time to put it all together. Stitch four squares together, forming one block. 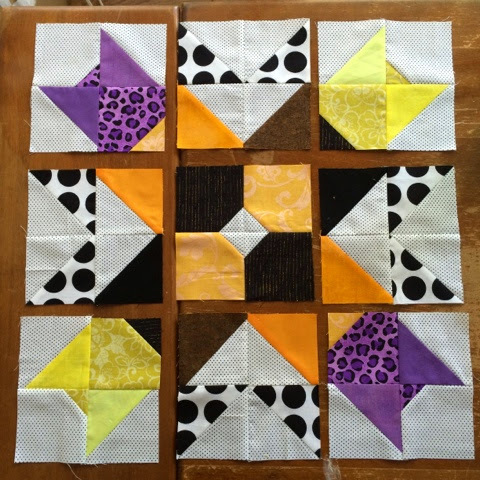 Now, stitch the blocks into rows. 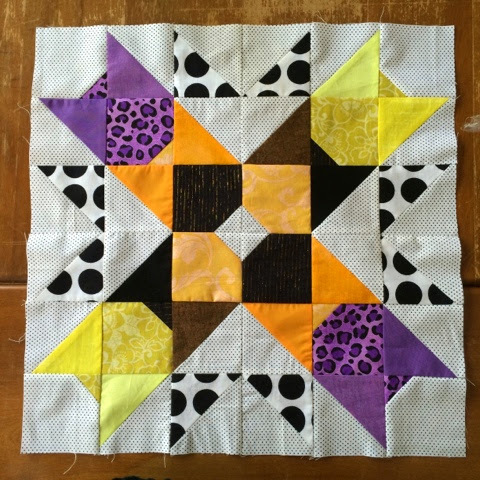 And finally, stitch the rows together to finish your Halloween CatStar Block. If you want to participate in the #halloweencatstar quilt-a-long, please be sure to use the hashtag and tag me (@schnitzelandboo) and Janda (@jrm0501) on Instagram. Don't forget, there's a sweet prize for one of our participants! 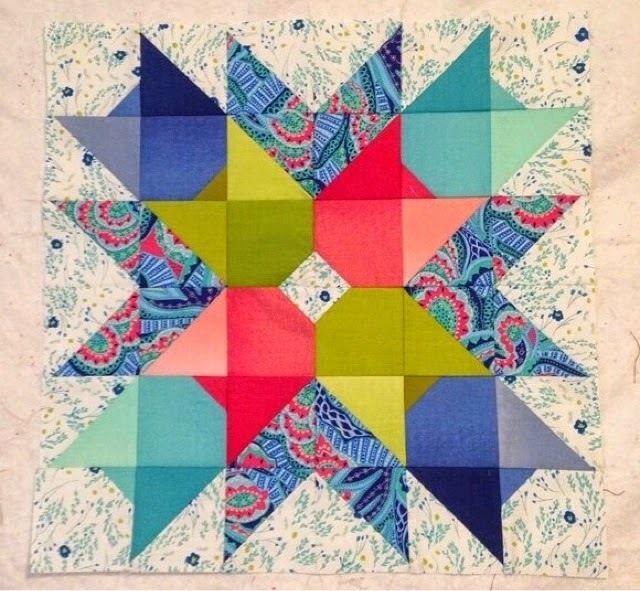 If you love this block, leave a comment and stop by Janda's Instagram feed and tell her. PS thank you IG @actsofcraftiness for catching my lack of info mistake! *finished size of CatStar is 18"
*deadline to enter your Halloween CatStar is October 28, 2014 because that's my birthday. I love this block. How clever! Thanks for making the tutorial.